This is an interesting interview that explains why mapping is important and how it should be done to ensure the final product is useful for policy. Unfortunately, much of the broadband mapping in the U.S. has been done by a telco-front group called Connected Nation that produces shoddy, unverifiable maps without making any useful data public. In this report, Gordon Cook interviews Sara Wedeman, a mapping expert who also works in behavioral economics. Cook describes the interview here, on his blog. The discussion ventures beyond mapping, offering keen insights into why universal broadband availability is so important. Wally Bowen has created a "cookbook" with step-by-step instructions for creating a community wireless network. This is a solid introduction to wireless networks. Larry Press takes a rather quantitative approach to demonstrating that the deregulatory telecommunications policies of the past few decades have failed to produce the desired outcomes. We are currently at a key turning point in history: the policies we enact today will have repercussions throughout the entire decade. Fiber is replacing copper, the question is who will own it because owners make rules. At a high level, everyone understands what it means for a network to be open: (1) whatever else it might do, the network offers a pure “transmission” service, so that users can freely communicate with each other; (2) users can connect any devices they want, as long as they don’t harm the network; (3) the network connects to other networks; and (4) the network doesn’t discriminate among users or among the services, information, and applications users want to provide to each other. None of these points should be controversial. The concept of open networks is at least 40 years old in the US. The FCC’s seminal 1968 Carterphone decision held that a network operator may not forbid the use of devices on the network that benefit the user and do not harm the network itself. A decade later the FCC established its equipment registration program requiring interfaces to the telephone network to be standardized and fully disclosed. 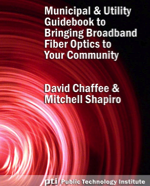 Distributed by Public Technology Institute, the Municipal & Utility Guidebook to Bringing Broadband Fiber Optics to Your Community is a free, comprehensive guide to the economic and quality-of-life benefits of robust fiber infrastructure. It examines in detail four communities that have successfully deployed fiber-to-the-home (FTTH) services to their citizens and businesses. Much misinformation has been disseminated about Burlington Telecom (BT). Here are the facts. BT is a city department of Burlington, Vermont, which owns a fiber-to-the-home network and offers triple play services (phone, cable, internet). The network depends entirely on subscriber revenues and is not subsidized in any form by the City. BT has saved the City money while being built entirely with investor money -- no tax dollars have been or will be used. 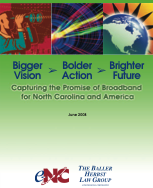 Jim Baller and Casey Lide of the Baller Herbst Law Group produced this tremendous white paper for e-NC. It covers the importance of broadband, relationship to economic development, and offers some recommendations. 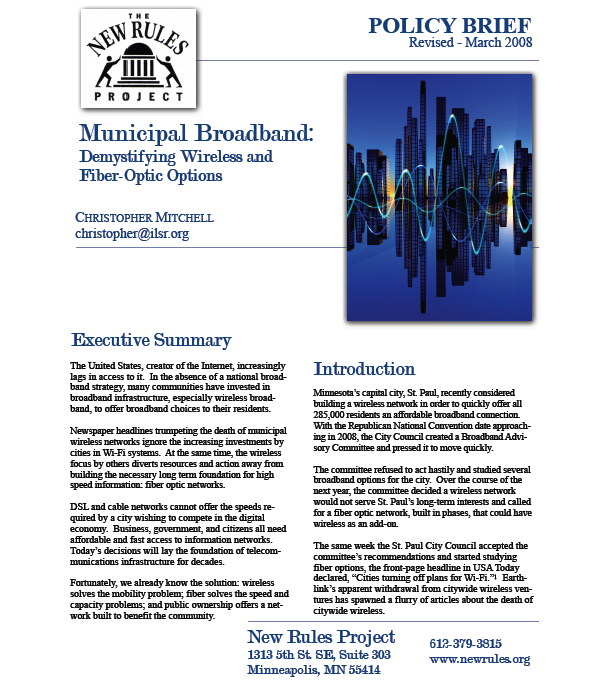 Deployments by municipalities were among the first FTTH systems operating in the United States. 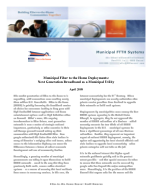 Though, in aggregate, they do not approach the number of FTTH subscribers of a Verizon – which currently accounts for two-thirds of all FTTH deployments in the U.S. – municipal systems do have a significant percentage of all non-Verizon subscribers. 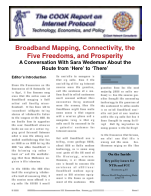 Further, they represent an important aspect of national FTTH deployment, namely, the option and opportunity for local elected officials and civic leaders to upgrade local connectivity - when private enterprise will not take on the job.